The fasting-weeks are the golden harvests of the musical artists; every evening some new singer or violinist is announced, with recommendations from Vienna or Paris; and sometimes one will undertake alone to amuse the St. Petersburg public, which would before have tasked the art of a hundred high priests of Thalia. The best of the fast-time amusements are the tableaux vivants, which are given with great taste and magnificence. The monotony of the fasts is now and then broken by the feast of some saint, which may fall in this time. Happy the saint thus celebrated; he may reckon upon numerous adorers; and happy the child whose birthday occurs at this time. He may be sure it will be kept till his eightieth year with great joy and festivity; first by his parents, then by his brothers and sisters, by blood and marriage, and afterward by his children and grandchildren. Family festivals are deemed innocent things, quite suitable to the seriousness of a fast, and therefore people try to make them as splendid as possible. Palm Sunday is another very agreeable interruption of the great fast. The children's festival is celebrated on Palm Sunday. The scene of this pretty fair is under the arcades of the great Gostinnoi Dvor, and in the adjoining streets. Huge bundles of twigs are brought into the city by the peasants, some very small, while others are great branches, almost as big as young trees, to suit the various amounts of piety; for while the severe orthodox father buys a whole tree, which he gets blessed in the church, and afterward suspends under the pictures of his saints, his elegant son contents himself with a delicate little twig, which he cracks like any ordinary whip. To these natural foundations are appended the palms which art has constructed to aid the poverty of a northern April. The bare twig is furnished with an abundance of leaves and flowers, some copied from nature, and some the production of a lively fancy. Some are made like the branches of fruit-trees, and hung with all the fruits of the east imitated in wax, with waxen birds and waxen angels fastened to the boughs with sky-blue ribands. A great number of natural flowers are also brought from the numerous hot-houses of St. Petersburg: centifolia, moss-roses, violets, hyacinths, and orange-flowers, for the elder sisters, who are not content to leave the fair with none but artificial flowers. As flowers alone would not be acceptable to children, sweetmeats and playthings are also to be had in abundance. The Russians have a peculiar talent for making-figures and toys out of the most worthless materials in the world; straw, shavings, ice, dough, they turn all to account. The stalls for the sale, or rather the exchange, of saints' pictures, images, etc. (for the Russian must not sell the picture of a saint, though he may exchange it, which he does sometimes for money), are also provided with a multitude of amulets, crosses, &c, of all possible sizes, forms, and materials; and if a person is not inclined to load himself with a heavier cross, he at least takes one of gingerbread, which he has the advantage of being able to eat when he is tired of carrying it. The dealers in plaster-of-Paris figures throng here in greater numbers than in their Italian fatherland. As this is a regular national festival, the emperor holds it his duty to honor it with his presence, and brings all his sons and daughters with him. On a bright clear day, such as even a St. Petersburg April sometimes affords, Kohl remarks that a walk here among all these significant and insignificant people affords one of the most amusing spectacles of the season; it is, as it were, the morn of the night of the great fast. On Verbnoi Subbota (Palm Saturday) a great procession takes place, in imitation of Christ's entry into Jerusalem, and all stream into the churches, carrying branches, and singing. The priests sprinkle branch and branch-bearers with holy water, and add a blessing into the bargain ; the greater number then carry away their palms. Whole groups are to be met with carrying them about till late in the evening—father, mother, and children, with the servants walking behind them; even the infant in the nurse's arms has a palm-twig, sprinkled and blessed, thrust into its tiny fist. As for the boys, the best use they can make of their twigs is to flog each other with them, which they do handsomely. Some of the more pious leave their branches till Sunday in the church, and many suspend them over their beds, ascribing all sorts of healing influences to the leafless twigs. The children also cherish theirs carefully, but for another purpose. It is the custom throughout Russia to punish those who sleep too late on Palm Sunday to attend early mass, by flogging them with the palm-branches. Girls and boys are all so eager to administer this discipline, that they lie awake half the night thinking of it; and as soon as the day breaks, they are run ning about in bands in search of and punishing the sleepers. This custom prevails throughout Bussia, and the imperial children exercise the privilege as eagerly as those of lower rank. The Easter-eggs play a very important part at this time of the year. St. Petersburg, lying in a plain little peopled either by man or barn-door fowls, must procure her eggs from a great distance. Moscow in particular supplies large quantities. On a very moderate calculation, there cannot be less than ten millions used at Easter in this capital; for, as it is always customary at Easter, ongreeting an acquaintance, to press an egg into his hand, many an individual may consume his hundreds. Nothing is said to be more amusing than to visit the markets and stalls where the painted eggs are sold. Some are painted in a variety of patterns ; some have verses inscribed on them ; but the more usual inscription is the general Easter-greeting, "Christohs vosskress" (Christ is risen), or "Eat and think of me," &c. The wealthier do not, of course, content themselves with veritable eggs, dyed with Brazil-wood, but profit by the custom, to show their taste and gallantry. Scarcely any material is to be named that is not made into Easter-eggs. "At the imperial glass-cutting manufactory," says Kohl, " we saw two halls filled with-workmen employed on nothing else but in cutting flowers and figures on eggs of crystal. Part of them were for the emperor and empress to give away as presents to the courtiers." As the latter receive many of these things, they, of course, give them away again to their friends and favorites, who, the next Easter, bestow them in their turn elsewhere; so that these eggs often travel to amazing distances. It is said that one, which came from the imperial palace, passed through numberless hands of high and low, till its last possessor, having let it fall on a stone, pitched the fragments into the Black sea. The wax-fruit makers and confectioners produce some pretty pieces of workmanship, in elegant boxes filled with eggs of all sizes in regular order, from the mighty ostrich-egg down to the nightingale's, and all in wax and sugar. Some are bonbonnieres, and very costly presents are also offered in egg-shells ; some are transparent, and in place of the yolk, contain little fairy bouquets,and some have a magnifying-glass neatly fitted in, and display houses and trees formed in wax, pictures of saints, and tiny angels couched on roses. A considerable trade is carried on in such commodities at Easter from St. Petersburg, which returns in imitative sugar the raw produce of the hen-house received from the provinces. On Holy Thursday the occurrences of the day are read out of the four Evangelists after mass. The priest stands in the middle of the church at a desk, on which burn three candles. The churches are in general thronged, and as every member of the congregation holds a taper in the hand, they make an uncommonly cheerful appearance. The poor take a pride in having these tapers as thick as they can get them, and may often be seen with beautifully-gilded tapers which have cost them a couple of roubles each. They are burnt throughout the Thursday evening, extinguished on Good Friday, and kindled again at midnight on Easter-eve. The streets of the towns and villages that are in general unlighted, are then gay with wandering illuminations as the taper-bearers go from one church to another; and that the tapers may not be extinguished, which is looked upon as an ill omen, they are carried in paper lanterns. On Good Friday there is no further ceremonial than the erection of a kind of tabernacle in the churches. ; in general, a mere box laid upon tressels and covered with a cloth; on the upper side of the cloth, the body of the Redeemer is represented in painting, embroidery, or half-relief. This tabernacle stands there till Easter-eve, with only so many lights as are necessary to show the objects. The doors of the churches stand constantly open, and the people go in and out to kiss the simulated wounds. In the last days of the fast expectation is strained to the highest pitch. On the Saturday before Easter-day the thermometer of religious inspiration falls below zero. The lights, the singing, the bells, all the pomp of divine service is consigned to repose. The devout are thoroughly exhausted with abundant kneeling and listening to the long readings. Many have had nothing whatever to eat for the last three days, and are really half-starved. The churches are as dark as the grave; no priest shows himself on the Saturday evening till midnight. It is customary for one of the congregation to take on himself the office of reading from the gospel. A desk, on which lies an open bible, is placed in the middle of the church ; one of the lower classes, who can just spell out Slavonian, will advance, light his taper, and read till some one else advances to release him. Except the beautiful church-singing, no custom of the Russian church seems so really touching and edifying as this public reading. Toward midnight the throng increases. 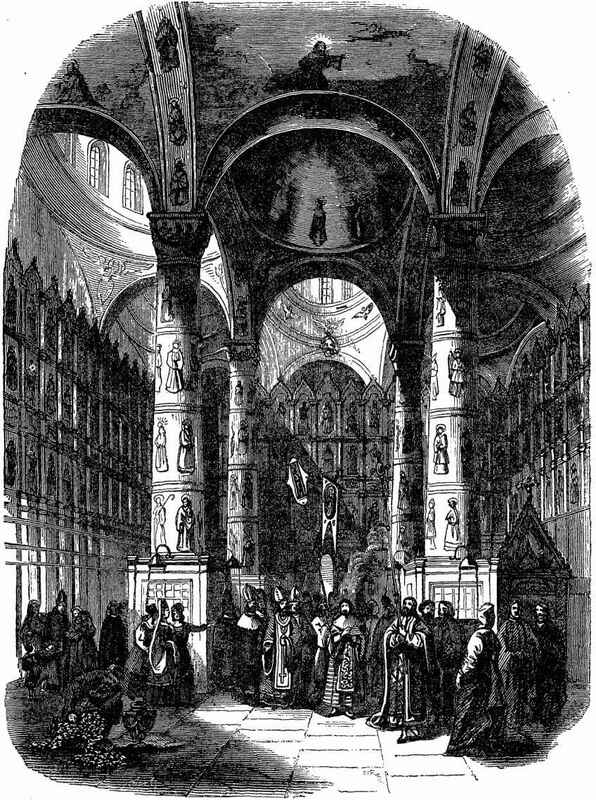 In St. Petersburg the court appears in the imperial chapel in full dress; and in the provinces the governor, with all his adjutants and officers in their splendid uniforms, attend the cathedral. The priests begin a mass, which is but languidly performed or listened to, till all at once, at the hour of midnight, the whole scene changes. The golden door of the "ikonostast" flies open, and the song bursts forth, "Christohs vosskress! Christohs vosskress ihs mortvui!" ("Christ is risen, Christ is risen from the dead!") At the same moment the illumination of the church is completed, not only the lamps and great chandelier, but the countless tapers in the hands of the congregation, which have been held hitherto unlighted. While the chief body of the priests, still singing ''Christohs vosskress" remove the pall with the corse, two others, in their richest dress, pass through the church with censers in their hands, repeating the joyful words, and stopping before the shrine of every saint to swing the censer and make their genuflections, and before every group of devotees to bestow their blessing. The congregation shake hands, and kiss all with whom they have the most distant acquaintance. The singing of the priests meanwhile continues. They also embrace each other; the bishop, metropolitan, or whatever priest of the highest rank may be present, now places himself before the ikonostast, and bestows on every member of the congregation who approaches him his blessing and a kiss, with the words " Christohs vosskress." The churches are illuminated without as well as within, and all the bells in the city ring out at once. In St. Petersburg, many of the streets and public buildings are illuminated ; rocket after rocket rushes along the sky, and the cannon boom at intervals, amid all the countless bells and voices echoing each other from all sides. Amid all this tumult, a procession, headed by the priests, all bearing tapers and torches, passes round the church; and then the last ceremony, the blessing of the food, takes place about three o'clock in the morning. The rich, who have the means of consecration at hand, do not find it necessary to carry their food to church, and moreover, they are sometimes quite content with the species of consecration a good cook bestows; but the poor can not enjoy their Easter-breakfast till it has been blessed by the priest;—perhaps they have a foreboding how ill it is likely to sit upon the stomach weakened by long fasting. The spectacle in the church is most extraordinary. They range all the dishes in long rows through the whole church, leaving space enough between the rows for the priests to pass, till the increasing numbers compel them to form the lines without the church, and even a good way round. The huge, oddly-shaped loaves, called kulitshe, the towers of white cheese, into which colored leaves of spice are interwoven—the former decorated with flowers, the latter bearing a burning wax-taper on its summit—the heaps of red-colored eggs, lumps of sugar, pots of honey, plates of preserved fruit—all these painted, illuminated, many-colored, strange-looking eatables, and collected in such quantities, must have a very singular effect. As the priest advances, sprinkling to the right and left, and pronouncing the blessing, while his attendant keeps up a constant chant, the people press closer and closer, crossing themselves, and keeping a sharp watch that their flowers and food get their due share of the purifying waters. The Russian Easter banquets must certainly be the most peculiar things of the kind that can be seen, both from the time at which they are taken (the sun often rising on the dessert), and from the appearance and demeanor of the guests. Whole colleges and corporations come in gala-dresses to pay their court. Thus the professors of a university pay their respects to the curator, the judges, secretaries, and other officers of the law-courts, to their president, &c. All is bowing, congratulating, and kissing. The cooks and confectioners give themselves a worldd of trouble to prepare their dishes with some reference to the time. Lambs made of butter are often paraded in the middle of the table, the fleece admirably imitated in the butter also; lambs of sugar, decorated with flags^ crosses, &c. Many dishes appear in the form of an egg, which seems to be held almost as sacred. Some years ago, a couft-lady gave an Easter-breakfast to the imperial family, at which every dish at table was served up in eggs. The soups sent up their savory steam from gigantic ostrich-eggs, furnished, as well as the other eggs fbr holding hot food, by the porcelain manufactory. Here eggs produced chickens full grown and ready roasted, and there a monstrous birth developed a sucking-pig; while pasties, puddings,"creams, game, fruit, and jellies, blushed through egg-shells of fine glass. Lastly, by way of dessert, eggs of gold paper were offered, containing almonds, raisins, and sweetmeats of all sorts. To be thoroughly national, two dishes are indispensable at an Easter-breakfast-—paskha and kulitsh. Paskha is made of curds beaten hard, and served in a pyramidal form; the kulitsh is a thick, round, cylindrically-shaped white loaf, sometimes made with a multitude of little kulitshi sticking upon it, like young oysters on the back of an old one, with plums, consecrated palm-twigs, &c., which latter always project a little from the crust. Both must be decorated with flowers and wax-lights. One of the most interesting features of the Easter, festivities is the Easter-kiss, already incidentally alluded to, and amusingly illustrated by the engraving on the preceding page. We will endeavor to give some idea of the extent of this singular custom. In the first place, all members of a family, without exception, kiss each other: if the family consist only of ten individuals, there are at once ninety kisses. Then all acquaintance meeting for the first time at Easter, and even where the acquaintance is but slight, would think it a breach of politeness not to kiss and embrace each other with the greatest cordiality. If we suppose now that every person in St. Petersburg has, upon, a very moderate average, a hundred acquaintances more or less intimate, that calculation will give for St. Petersburg alone, with its half-million inhabitants, a sum total of fifty million Easter embraces. Let us consider only on how large a scale many individuals must carry on the business. 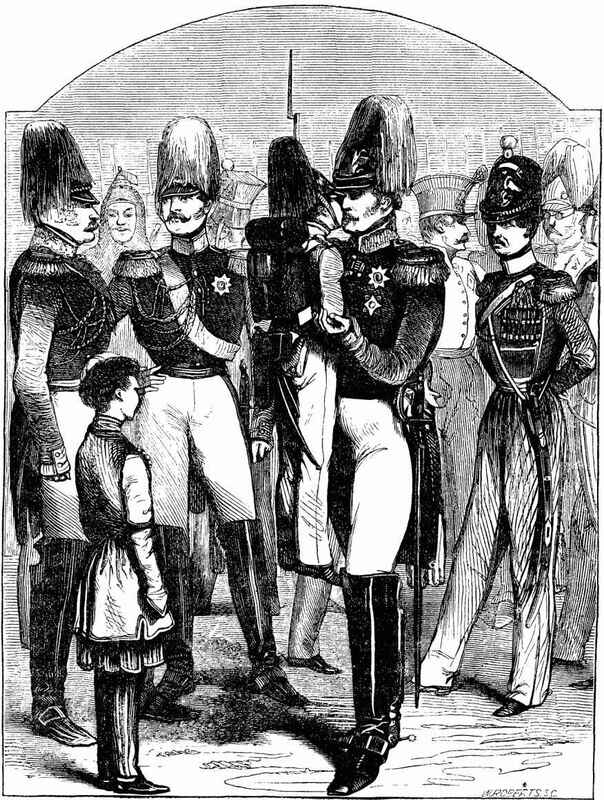 In the army every general of a corps of sixty thousand men must embrace all the officers, every colonel, those of his regiment, and a select number of soldiers into the bargain. The captain salutes all the soldiers of his company, who are mustered for the purpose. The same in the civil department; the chief embraces all his subordinates, who wait on him in their gala-dresses. Considering how numerous are the divisions and subdivisions in a Russian bureau, the chief must have no little occasion for lip-salve on the following day; for these official caresses are by no means mere matters of pretence, as they are sometimes on the stage, but real downright smacks, such as might be exchanged by lovers. A subordinate officer has enough to do, who has often a dozen grades above him; but as to the poor dignitaries, they must be fairly out of breath. Herein, of course, as in all other cases, the largest share of business falls to the emperor's lot. Let us consider his numerous family, his enormous retinue, the countless numbers who come to salute him on Easter morning, those of the nobles whom he is more intimate with, and may meet by accident; and even then he has not done. On parade the whole body of officers, the cadets, and some of the privates picked out for the occasion, are honored with an imperial embrace, which is not refused even to the meanest sentinel of his palace as he passes him on Easter Sunday. The Emperor giving the Cadets the Easter-Kiss. 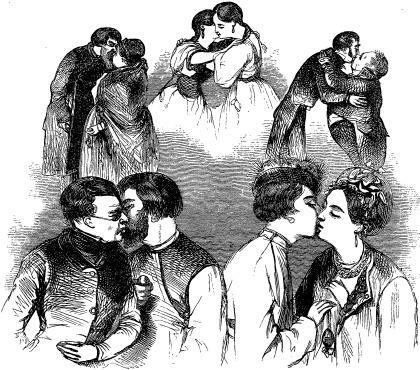 As all these caresses are given and received with the greatest cheerfulness, and amid smiles and handshakings, as if they saw each other for the first time after a long separation, or after some heavy and long-endured misfortune, it may be easily imagined how many gay and amusing scenes are passing in the streets and houses. 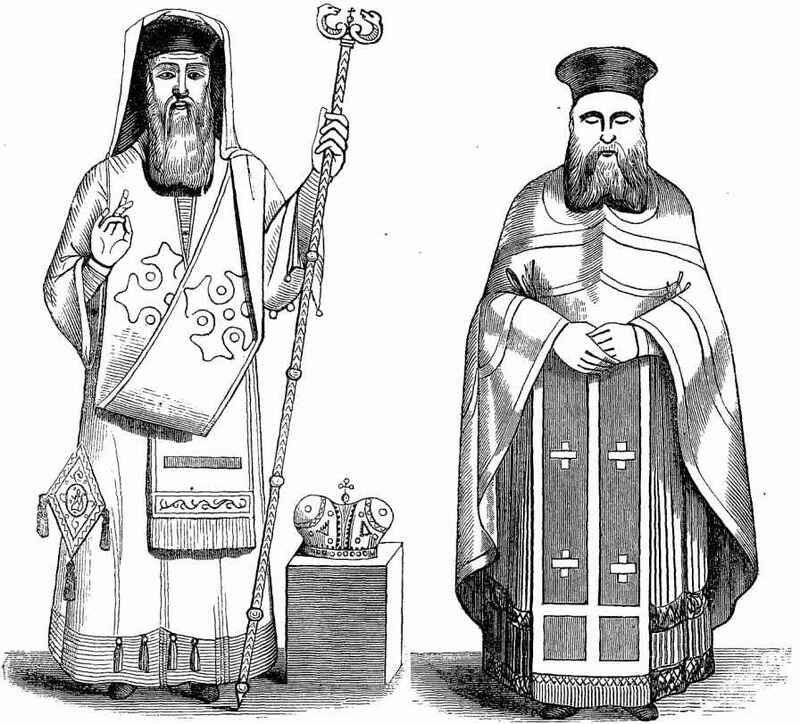 "Christohs vosskress, Yefim Stephanovich" ("Christ is risen, Euphem Stephen's son"), bawls one bearded fellow to another. "Voyst venno vosskress?" ("Is he really risen?") Then they seize each other's hands, embrace heartily, and finish with Padyom v'kabak brat" (" Let us go to the public-house, brother") ; and to the public-house they go, where the brandy runs as freely as clear water in Mahomet's paradise. It is an exaggeration, however, to assert, as some travellers have done, that, under the shield of ''Christohs vosskress" any stranger is at liberty to salute any unknown fair one. It is true that even in the higher circles some elderly gentlemen will take advantage of the season, and give, occasion for some badinage among the young ladies, though it is never taken amiss. The coachman and other male-servants kiss the children of their masters without ceremony, but only the hands of the grown-up daughters ; the domestics on these occasions fill their pockets with painted eggs, one of which is presented to every one they salute, or from whom a trifling douceur may be expected in return. During the whole of the Easter-week the churches stand constantly open, and even the golden doors of the sanctuary, which remain closed throughout the year,. excepting at certain moments during divine service, now admit the gaze of all. The more pious, generally, hear a long mass every morning before they hasten to their amusements. The holydays are closed by a " filial mass," at the end of which " the division of bread" takes place. Large loaves are baked, the outer crust of which is colored red, and stamped with the words " Christohs vosskress ihs mortvui" in gold letters. These loaves are cut into small pieces; the priests fill some baskets with them, carry them to the railing round the altar, and throw down the bits of bread among the people, who stretch out their hands with eagerness. The pieces are anxiously examined to see who has got the letters. Those who obtain the characters forming the first word of the inscription hold it for a particular piece of good-fortune; but the holders of the last word, "mortvui" (death), on the other hand, are much grieved, and esteem it a very bad omen. With this ceremony, as before said, the Easter-holy days, properly speaking, end. Everything, however, has a conclusion, then an end, and then a real and complete cessation. So there comes halting behind the Russian Easter yet another holyday, which may be said finally to close the doors of these festivals. It is the Monday after Easter, called by the Russians " Pominatelnui ponyedelnik" (" Recollection Monday"). This Monday is, no doubt, brought in connection with Easter, partly because it follows so immediately, and partly because the resurrection of Christ has a natural connection with the hoped-for resurrection of those dear to us. To say the truth, Recollection Monday is a kind of monster of a holyday, for in the manner of its celebration religious gravity is so much revolted, and yet the feeling and fancy flattered by so much that is kindly, that we know not well whether we should condemn it for its indecorum, or cherish it for its child-like simplicity. In the morning the people flock to the cemeteries, and after attending service in the chapels belonging to them, in memory of and honor to their departed friends, take a meal over their graves ! At a very early hour the never-wearied holyday-folks may be seen setting forth, with bag and baggage, on foot and in vehicles. The food is carried in the first place into the chapels, and laid upon the table in the middle. There is generally a large; round loaf in the midst of a dish ; and round about it the red-painted Easter-eggs, salt, gingerbread, oranges, and lemons. In the midst of the loaf a lighted taper is always stuck, without which a Russian, no more than a Gheber, can observe a religious solemnity, the clear flickering flame being to him always a symbol of the spiritual. Every one has his loaf of a different form from the rest; one has added a dish of rice and plums, another a pot of honey, and a third some other dish, according to his means. On every loaf a little book is laid, called " books of remembrance," in which the names of the departed are usually inscribed. After the usual mass, the priests approach the strangely-loaded tables and sing prayers for the dead, swinging the censers all the while. They turn over the leaves of the before-mentioned books, and introduce the names there found in the prayer. When this general prayer and consecration is over, the people disperse about the churchyard; each party seek the graves of their friends, particularly of those lately lost, and weep over them. The greater number mourn in silence ; but some, whose sorrow is yet new, cast themselves in despair upon the earth, and give it vent aloud.
" On one occasion," says Kohl, " I noticed particularly one old woman, whose voice of lamentation resounded over the whole burying-ground. I went up to her and asked for whom she mourned. She raised herself and answered for a young married daughter. Then she threw herself down again with her face to the grass, and cried into the grave as if her child could hear: 'Ah, my dearest daughter, why hast thou forsaken me ? Ah, thou loveliest! thou young one! why hast thou left thy old mother with her seventy years ? Couldst thou not wait till she had gone before thee ? Ah, my daughter, is it not against nature that the child should leave her mother un'tended ? And thy little son, thy Fedor, he too is left. Alas! alas ! my daughter, son and mother are left alone !' Thus she mourned till the priests came to her grave. I can not express how deeply the lamentation of this poor old woman affected me, as she chanted her sorrow in a kind of church-melody; now and then ceasing entirely, and burying her gray careworn head in the grass." The priests in the meantime parade the churchyard with burning tapers and crucifixes, and perform a special service over every grave where it is desired, the "books of remembrance" being handed to them for the purpose. The priests are generally followed by troops of unfortunate persons, cripples and beggars, who expect to receive part of the food in alms. Some of the mourners give the whole of what they bring, and make thus a worthy offering to the departed. The majority, however, spread their napkins over the graves, arrange their food upon them, not forgetting the wine and brandy-bottles, and set to work with as good an appetite as if the day had been preceded by seven years' of Egyptian famine instead of a Russian Easter. The priests, of course, come in for a share, and taste something at every grave. Kohl remarks that he approached one company, consisting of some official persons, among whom there was one decorated with a couple of orders. These people had covered a long grave with a large tablecloth, and had loaded it abundantly from a store in their carriage, which was drawn up close by, and out of which they were continually fetching fresh supplies! Two priests were among the revellers in this group, and were challenged more frequently than any others of the party. Not before night are the dead left in peace in their last resting-place, and many, unfortunately very many, leave in a condition which may be said to have turned the day of remembrance into one of complete for-getfulness. The great excesses committed at this season are particularly misplaced, when the digestive system has been so much lowered in tone, and cause much sickness among the lower class of Russians; so that, for many, their holydays are attended by very evil consequences. The hospitals are never so full as after Easter; and, according to the statement recently made to a traveller by a Russian physician, statistical writers, in giving the bills of mortality for the several months, might safely quote the Easter holydays as in some measure accounting for the great number of deaths in the month of April.